A few months ago I posted about some of my weekly local Arizona Goodwill thrift findings. 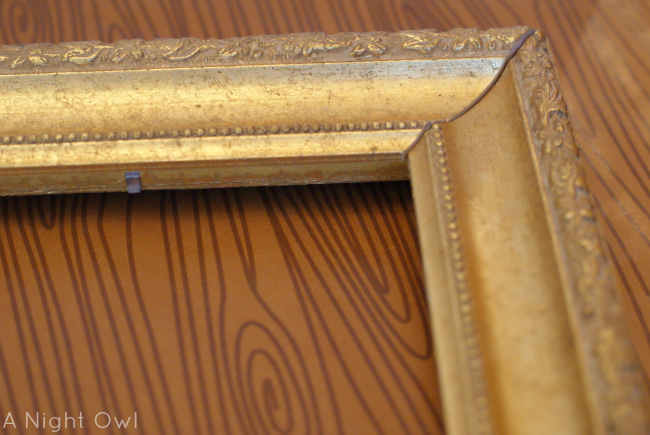 Among that group of items was a gold wooden frame I picked up for just $2.99! 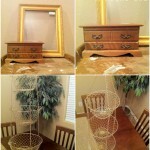 Back then I had thoughts of painting the frame and making it into a wreath; however, I’ve since had a change of heart. I actually really love the aged golden color of the frame. 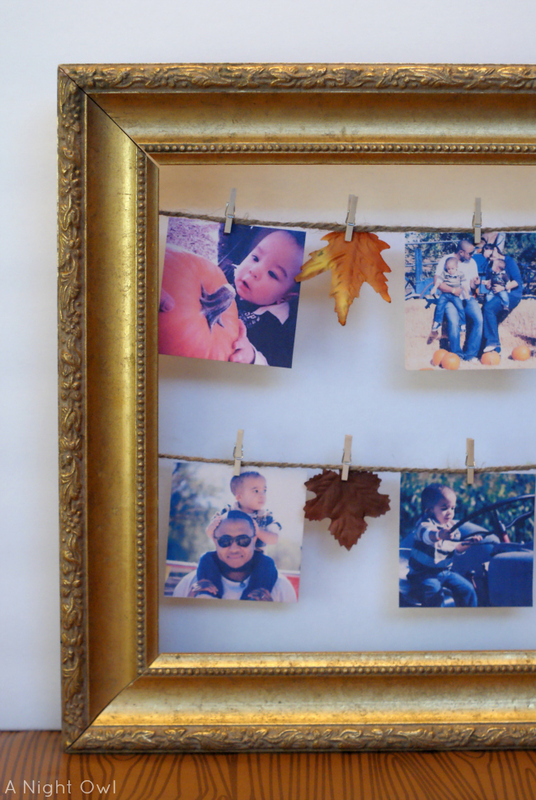 And instead of a wreath, I’ve made the frame into an interchangeable frame for my Instagram photos! 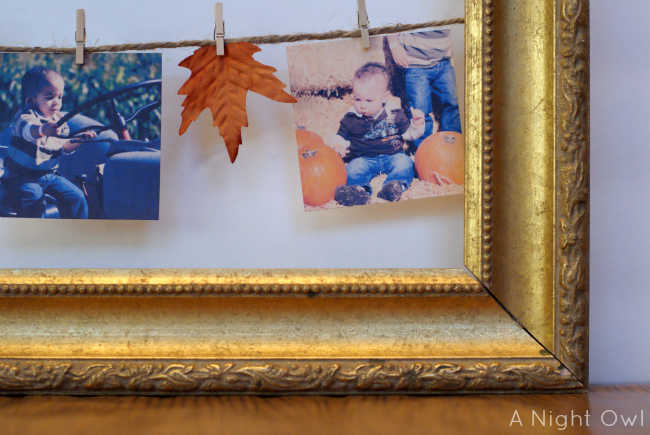 Now you’ve seen the frame before from my Instagram Mantel, but I thought I’d put together a quick post on how I hung the photos and updated the frame for Fall! To set up the frame for photos I simply removed the pane of glass (it didn’t come with any back boards) and bent down the prongs holding the glass in. 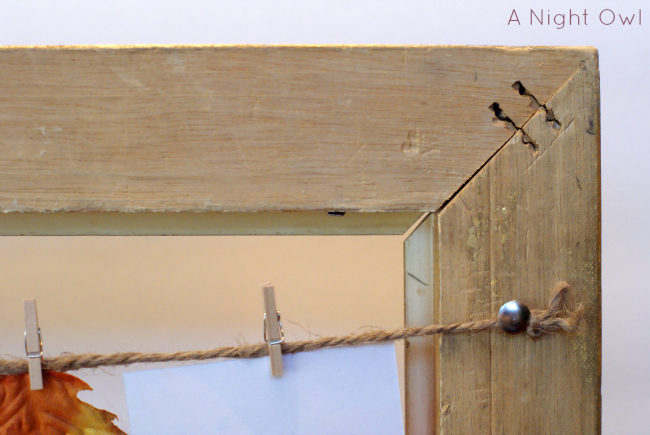 I then tied the ends of two lengths of twine and secured them to the back of the frame (which is wood) with push pins. And just like that, if you grab a few small clothespins, your frame is ready for your pictures! I wanted these pictures to be “Fall-themed” so I downloaded some pictures we took of the family at the pumpkin patch last year! Such fun memories and I think it’s so cute to showcase those pictures right now. 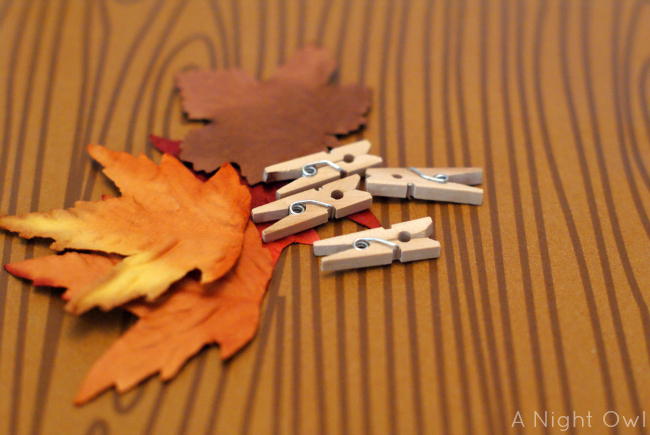 Lastly, I added a few small leaves with clothespins to add to the Fall feeling. It’s now ready for my Fall Mantel! I’ll be posting that soon, so stay tuned! That is such a lovely idea!!! I think I’ll have to try that. Hopefully I can get those little clothes pins at Michaels. Thanks Heather! You can absolutely find them at Michaels! 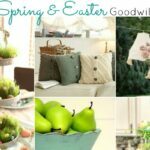 That’s where the small leaves are from and though I found my clothespins at Hobby Lobby, I’m sure Michaels has them as well. 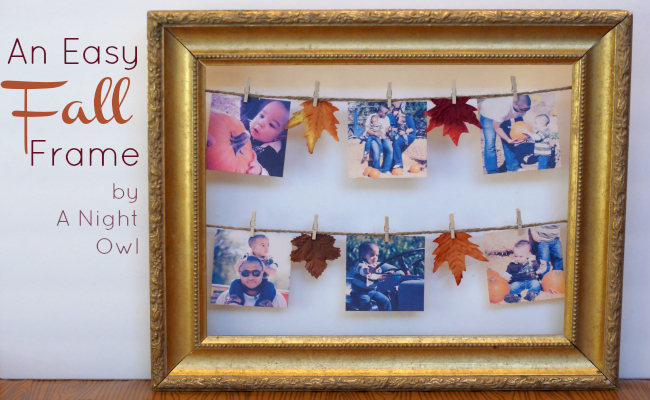 That’s such a gorgeous, easy project! I love it, especially incorporating Instagram pics! Thanks for sharing! Love it, glad you didn’t paint it too. That is so cute and so perfect for fall! ohhhh super cute! I knew I followed you for a reason. ha. 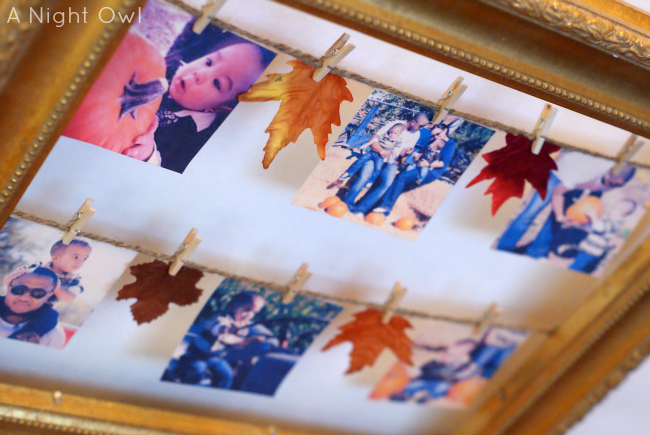 What a great idea, using photos from a fall outing keeps it in season. This is beautiful! I love that it is personal and seasonal! Have a good night! Sooo pretty! 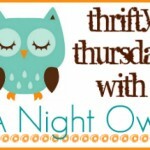 Thanks so much for linking up to Do Something Crafty Friday! well, that doesn’t look like it could be any easier. super cute display! Thank you! I’m all about easy and versatile! LOVE this. I love the gold frame…which was a steal of a deal. 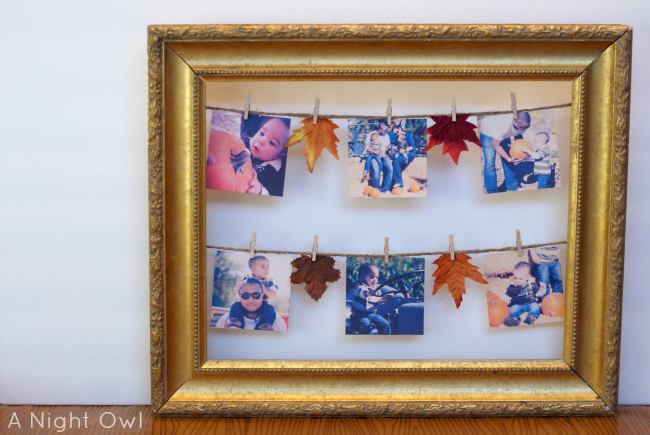 AND I love how you have your pictures and the leaves displayed. Really perfect for fall. So cute! I love how you did this! 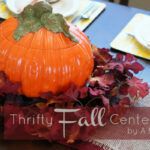 Thanks for linking up to our Pretty Things Party. Hope to see you back next week! Love how rustic this looks. Thanks for stopping by our Pretty Things Party. Hope to see you back next week! Super cute, I love the little leaves! 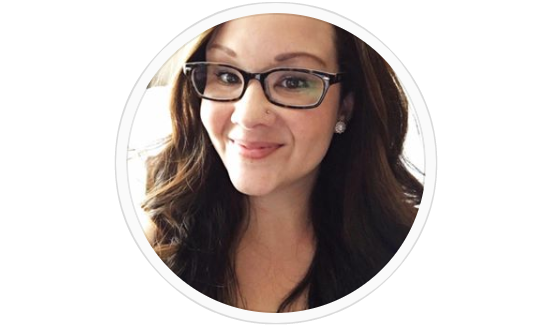 Thanks for sharing this at The Fun In Functional! I love this awesome idea 🙂 thanks for sharing!